Dog eats dog? Or a fellowship of mutual endeavour? They open doors. Like many professions, academia is a lot about your reputation and who you know (as well as what you do!). Your networks open doors to other people who can be potential collbaorators and reviewers, to the extent they can ‘vouch’ for you. This can be very useful in reaching out to senior people in your field. They keep you in the loop. You don’t know what a given funder may be looking for or be wary about, but someone in your gang probably does – this sort of knowledge could be the edge that means you get the prize of funding, etc. They are a source of social support. Social connections are essential for mental health, and academia can be a stressful job. Your friendship circle is your professional support network. They make you more creative. I can’t count how many ideas that turned into research projects started off over a coffee (or, a beer!) with colleagues. They can become real friends. Many of the people I count as close personal friends are people I met whilst working, and are in my professional friend groups also…. Of course, there are also tensions in such groups. When efforts from people aren’t equitable with the outcomes they receive, it can generate resentment. Academics also routinely collaborate in some ways, whilst at the same time competing in others (i.e. a colleague may be collaborating on a research project with you, whilst also putting in opposing bids for funding in the same pot as you). Finally, peoples’ careers progress at different rates, and they can be more or less able (or willing!) to contribute which can amplify the above issues. So, professional relationships are always complex ones (even when they are enjoyable and productive!). Academia is also a industry of niches- people studying one area will have close colleagues (and competitors) who do things very similar to them. But there are also people in other disciplines (and sub-disciplines) which you have less in common with. These potential professional relationships are often not direct competitors, but neither are they natural collaborators. You’ll see things from a different point of view, and your idea of what is interesting and worthy of pursuit may well differ dramatically. However, in an age of multidisciplinary research, these differences also potentially make the the most important collaborators of sorts – and if you give these relationships time and attention, they may pay off in very unexpected ways! They also give you a chance to exchange notes, ideas and frustrations with people who you are not directly competing with – which itself is useful. 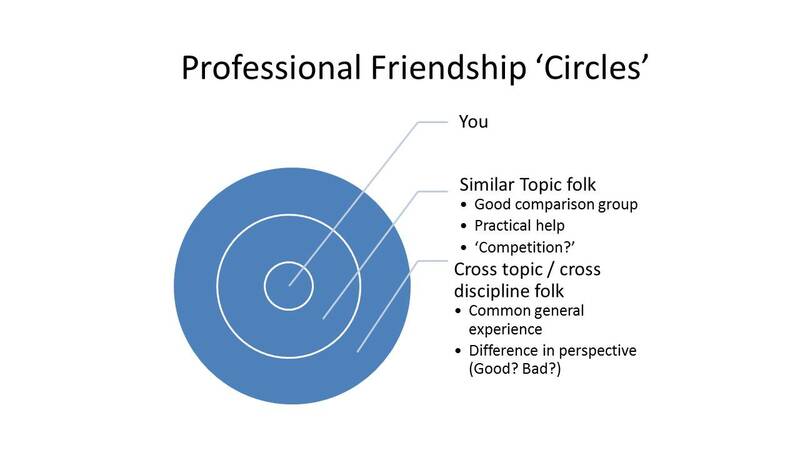 These thoughts have led to me to toy with a new way of conceptalising social connections in terms of ‘professional friendship circles’ (see below). As you can see, the idea here is that you are immediately surrounded by people in your close circle- those with the most relevant research to yours. These folks are you best collaborators, the most valuable folk to have in your ‘gang’ but also your competitors. Outside of this, you also have people a bit further out- these folks are less involved in what you do, but perhaps offer a space to branch out into new things. I am by no means an expert here, but here are some suggestions…. Don’t force it – if the relationship is going to go that way it will. Sometimes collaborations have several false starts – ideas which seem great but never get off the ground. That’s ok, again give it time. Nothing lasts forever! Enjoy good relationships when they are productive, but also be prepared to ease back on how closely you work with people as time goes by, or just adjust to a new type of relationship. Ignore that last one, a bit! Some collaborations do a really really long time, if you get one of those, treasure and nurture it! Previous Previous post: Oxford Street – did people panic?